In realty the US and Nato attempts, after the fall of the Soviet union, to be the sole politacal player in the Arab world and middle east faced fiece resistance in Afhganistan Iraq, Lebanon and Palestine. A combination of the cowboy Wars defeats led by the US and NATO (since the Bush administration), and the failure of the Arab stooges and the financial crisis (since 2007) alongside the economic rise of China and India has, however, given a boost to the aspiration of the NAM. “The Arab Spring of 2011 Resistance Axis offered further proof of the new confidence of the people of the ‘South’ and Arab word, threatning the regimes that had given themselves over to pro-Western economic policies and opened their prisons to become the “black sites” of the War on Terror. Syria never given itself to pro-western economical policies, and Libya was attacked for trying give-up the pro-western economical policies. Moreover the South America states, and real progressive activists were under attack for standing against the Cowboy WARS on Libya and Syria (Prashad, the author, was against the war on Libya). The US had lost Latin America, fearing it would lose the Arab world as well, pulled all its cards, the NGO’s the International American Brotherhood highjack the popular movements, and install new puppet regimes in Tunis, Egypt, Libya and Yemen, and at the same time Launched its Global War to destroy Syria, the corner stone of the resistance axis, and turn Syria into a corner stone in the ANTI-RESISTANCE AXIS, to destroy Hezbollah before checking the Iranian King. In fact because “Turkey has reached the point where it has discovered that its own domestic problems (namely the Kurdish question)” therefore, Muris the America‘s other Brother Jumped to continue the Turkish mission of balkanization of Syria. His short stay in Tehran, and his Speech at NAM confirmed that Brotherhood’s Egypt is the real problem and can’t be a part of any solution. I always said that Usrael would be glad to see Assad removed by Islamists, ans would be glad to see them killed if they fail, so, I wonder what Mursi can do for his Amecrican brothers in Syria? Nothing, more than saving the faces of Qataris, Saudis and the Turks, most likely, opportunist Mursi the son of opportunist brotherhood realizing that the battle on Syria is almost over, is trying to reserve a chair on the Syrian reconciliation table, ignoring that where there is no place on that table for traitors as Assad made it clear in his interview by Al-Dunia channel. on the Egyptian side of the border city of Rafah on August 29, 2012. Meanwhile, Lieberman is not satisfied with Mursi’s performance in Sinai (Cleaning Sinia from Islamists threatening Israel, and destroying Gaza tunnels to cut the the supplied of Islamic Jihad and other resistance factions). Having, started withdrawing his forces from Sinia, Lieberman is waiting to see President Mursi visit Jerusalem. 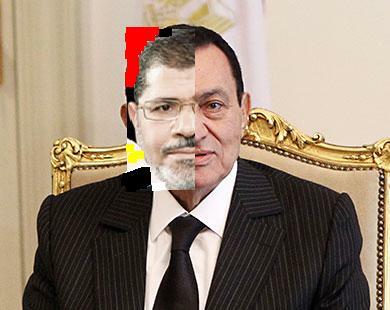 I don’t think stupid Mursi, is so stupid to do what Mubarak never dared to do. The 16th Non-Aligned Movement (NAM) summit opened on Sunday in Iran, with two-thirds of the world’s governments gathering in the Iranian capital. The NAM, since the 1980s, has been notably adrift. The debt crisis of the 1980s and the emergence of US primacy after the fall of the USSR at the end of the decade created a major crisis in the Global South. As the states of the South became to seek new alignments with the North out of economic needs or political ambitions, the agenda of the NAM fell by the wayside. A combination of the cowboy wars led by the US and NATO (since the Bush administration) and the financial crisis (since 2007) alongside the economic rise of China and India has, however, given a boost to the aspiration of the NAM. The assertions of the BRICS (Brazil, Russia, India, China, South Africa) in the 2012 Delhi Declaration and the solidarity of the South at UNCTAD XIII in Doha in April of this year underlined the emergence of this new confidence. The South’s mood has been further enlivened over the past five years by the emergence of popular movements that oppose neoliberalism and imperialism. The South’s mood has been further enlivened over the past five years by the emergence of popular movements that oppose neoliberalism and imperialism. Their first stand was in Latin America, where the social and political movements were able to translate their popularity into the electoral domain. Most of the governments south of the Rio Grande River now oppose US primacy. In 2010, these Latin American states created the Community of Latin American and Caribbean States to undercut the formerly US-dominated Organization of American States. The Arab Spring of 2011 offered further proof of the new confidence of the people of the ‘South’. Regimes that had given themselves over to pro-Western economic policies and opened their prisons to become the “black sites” of the War on Terror fell like ninepins. If the US had lost Latin America, it was now feared that it would lose the Arab world as well. NATO’s war in Libya and the Syrian crisis has afforded the US an opportunity to re-enter the Arab world as a major political player. This is what makes the Syrian crisis so central to the work of the NAM – apart, of course, from the more humane objective, which is to end the violence against the Syrian people. A cynical set of geopolitical calculations has made each side to this conflict take maximum positions, which rendered Kofi Annan’s mission to Damascus impossible. It is essential to create the political context for Lakhdar Brahimi, Annan’s successor, to be able to move an agenda. One small part of the process to create the policy space for Brahimi has been proposed by Egypt – the Contact Group. The group will include all the major regional players: Egypt, Iran, Saudi Arabia, and Turkey. The NAM meeting was to be the setting to increase confidence for the Contact Group. If the NAM gives its endorsement to this Contact Group, it might be able to create a regional roadmap, allowing Brahimi and the UN to try and find a procedure to end the violence in Syria. To have Iran and Saudi Arabia in the same process is both startling and a sign of hope. Saudi Arabia will be represented by Prince Abdul-Aziz bin Abdullah, the son of King Abdullah. He is a popular prince who is the acting Deputy Foreign Minister. The entire top brass of Iran will be in attendance. To have Iran and Saudi Arabia in the same process is both startling and a sign of hope. Trapped by its own regional alignments, Iran has yoked itself firmly to the Assad regime. Saudi Arabia and Qatar have thrown in their lot with the rebellion, as has Turkey but with less fanfare. Such “unity” was not available at the Arab League summit in March that was held in Baghdad. The Saudis and the Qataris refused to send their top leadership because of their serious difference of opinion with both Syria and Iraq. Qatar sent minor bureaucrats and the Saudis sent their Arab League ambassador, Ahmed Qatan. No princes graced the occasion. The government of Iraq’s Prime Minister Nouri al-Maliki had refused to stop Iranian aircraft from going through their airspace to Syria, and Baghdad was not willing to join in the isolation of Syria. The ground has shifted since March, and now the regional powers seem willing to see if cooperation is possible in order to bring stability to Syria and the region. Turkey has, unfortunately, refused to come to the NAM meeting. It is not a NAM member, but it has been invited to attend as an observer. There is a precedent for this, since Australia will be in Tehran as the West’s listening post and has threatened to walk out if anything it deems inappropriate is said. Foreign Minister Ahmet Davutoglu will not attend, and neither will the top leaders of his party in the government. Davutoglu, an academic, has developed a foreign policy that Hurriyet’s editor Yusuf Kanli called “no friends in the neighborhood” strategy. Turkey has put its hand in the fire of the Syrian cauldron, and no longer knows how to extricate itself. It was one matter to be moved by the violence of the Assad regime, but another to make itself a party to the conflict. Contradictions of geopolitics abound. During the high-point of the Arab Spring, Prime Minister Recep Tayyip Erdogan put Turkey forward as an example for the new Middle East. Now Turkey has reached the point where it has discovered that its own domestic problems (namely the Kurdish question) might erupt if Turkey presses ahead with the balkanization of Syria. Ankara has reached the ignominious state of having to petition the US to support its idea of a buffer zone on Syrian territory, absent of a UN mandate. Mursi’s Contact Group would have, however, allowed Turkey an exit from what appears to be serious miscalculations of Davutoglu’s foreign policy. Assad’s fall, which is inevitable, might not be propitious if the virus of sectarianism is not stemmed. Egypt’s proposal should be supported as it it builds on regionalism and takes seriously the fact that absent the assent of these regional actors, no pressure can be put on the parties in Syria to stand down. Europe, the US and Russia have played central roles in fueling the crisis, but they are not going to be able to be part of the solution. The regional actors need to take the reins. The Contact Group would be strengthened by an endorsement from the NAM, and it would further embolden Brahimi to make serious inroads into the deadlock between the Syrian government and the opposition. Absent regional pressure, backed by NAM, the blood-letting will continue in Syria – to the detriment of all the people of West Asia. Vijay Prashad is the author of Arab Spring, Libyan Winter (AK Press, 2012 and Turkish edition, Yordam Kitap, 2012).